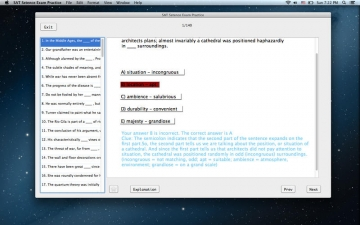 SAT Sentence Exam Practice | Mac App Storeのアプリ検索・ランキング BuzzMac! SAT Sentence Exam Practice help you ace your SAT exam. The app covers error identification and sentence completion parts of the exam. * Detailed score report after each test. We’ll figure out what kind of test taker you are and keep track of the questions you answered. * Complete explanations to every question. We’ll show you what mistakes you made and how to correct them. * Study mode helps you get instant answers and study at your own pace with detailed explanation of each question. * Test mode simulates real exam experience with timer and scoring report. You could also review your test with explanation. * Adding to favorite feature helps you to bookmark hard questions for later access. * No internet access necessary for usage after downloading our app. Aihua Soft Inc., the publisher of this product, is not affiliated with or endorsed by any testing organization. All organizational and test names are trademarks of their respective owners. The content of the application might include inaccuracies or typographical errors, for which the owner can not be held liable.